Here we are, in that strange no-man's-land between Christmas Day and New Years Day. A time of clearing away, finishing off, sales fever, and reflection. I'm sure there will be many blog posts about New Year Resolutions, and reviews of Old Year, and I may or may not go down that route later on, but for now I'll just keep it low-key and local. Above is a post-Christmas view of our little tree, sans the splendour of all the presents round the base. We don't do 'large and natural' these days, this pretty good artificial has done us proud for a good few years now, and the size s just right. Christmas cards are, apart from the tree, the sum total of our decorations. Oh, and a wreath on the door. Oooops! Did you spot the reel of elastic nestling between the cards here? Luckily it is not the knicker variety, I don't know how it found its way here! The sunny view out of my sewing room window this morning, across the nursery field to where the cattle are chomping at hay bales. It is gorgeous here in West Norfolk, but very cold outside! The garden in the sunshine looks a bit thread-bare this time of year. Jim spent yesterday afternoon hoovering up the fallen leaves. Well, most of them! 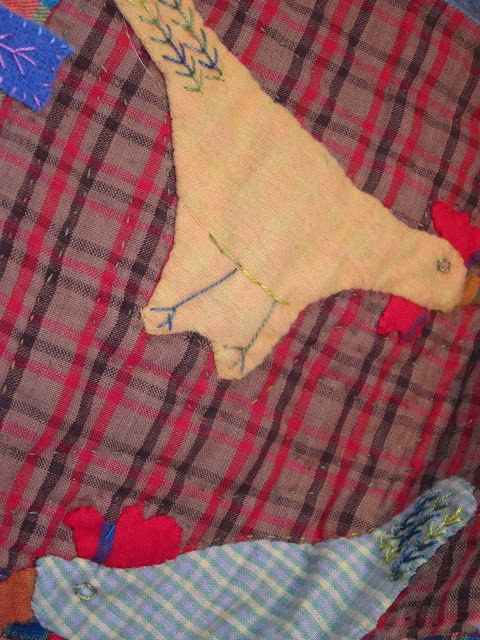 I've done a fair bit of embroidery on the quilt - sometimes in my sewing room listening to audio-books, sometimes in front of the television while we watched a bit of Miss Marple, or a video. Can't say the Christmas tv has been all that spectacular. Finished the applique on this, ready for stitching into a cushion cover. Need to find a cushion form! And here is my ready-to-go box for bangle-making; it's handy to just grab the box and bring it into the living room in the evening. So, are you tuckered out with turkey and trifle, or have you got rid of all the left overs? Planning your New Year Resolutions, or firmly forsaking the very idea? Back at work, or at least back in the old routine, or still enjoying a little peace and quiet before reality kicks back in? I'm pleased I've got back into the swing of blogging, and I shall now go and catch up with what you've been writing on yours. If I don't manage another post before next Thursday, Happy New Year to you all! Lovely post - I enjoy this week between the Bank Holidays as the diary is empty and I can get on with whatever I like at home. Have been having a clear out and getting rid of "stuff" I swear it breeds if you don't watch it. Love the look of that quilt do show the full Monty sometime won't you? It's been sunny here today but the frost hasn't shifted from the garden all day and now it's getting even colder again. Best wishes for 2014 to you and yours. Hi I've just found you via another's blog, so pleased I was nosey enough to pop by, what a lovely blog. I love the embroidery and appliqué you're putting on. Beautiful! Hello Peg lovely to meet you and thanks so much for commenting - enjoy the archive! I find it difficult to deal with this 'circle' business as opposed to a straightforward blog - do you have a blogsite I can click straight onto? I'd love to check you out and leave a comment! I think you must sew in your sleep! We had a quiet Christmas although spent a good part of Friday with DB in MAU! All ok, just locum doctor being over cautious! Oh no! I hope things are ok Dc, as you say, just an over-cautious GP but enough to raise your blood-pressure and lower your mood. Hope things are good now. The stitching is done when I have a moment, and I don't 'watch' tv without something to do as well! No turkey or trifle here... Hugh F-W's lemon sponge, a free range chicken with homemade stuffing and lots of veggies, that was Christmas Day dinner. Leftovers - parsnips, potatoes, stuffing, meat, sprouts, all fried up with fresh chestnuts and a fried egg, frilly and crispy round the edges, perched on top. No New Year Resolutions here either.... I make New Year Intentions, far less stressful than Resolutions... if you resolve to do something then you more or less feel you have to, if you intend to do it, then something more or less important may get in the way but it doesn't matter! Skew whiff thinking or what? Only a small fartihishal tree here too - we have three to choose from, black, white or green, it was the turn of the white one this year, untraditionally bedecked with baubles of turquoise and purple, with beads to match, the odd tiny fairy tucked in here and there as well as on top. A few cards attached to a large wire heart. A handmade wreath (crocheted a la Lucy in her Attic) on the front door, a more traditional twiggy and berry affair on the back door. Extra fairy lights in the garden, and that was it. I always find New Year more exciting, a whole year and who knows where it will lead, what adventures or mishaps may occur? Will I make any new friends, lose any more old ones (through my own fault, the latter it has to be said, too outspoken!). Ah who knows, but I'm looking forward to it.... ignoring the health issues that may rear their uglies from time to time. Hi Edwina, a woman after my own heart! To be honest I enjoy the fiddly bits more than the turkey - I could feast quite happily on a plate of chippolatas in bacon, sausage-meat stuffing, bread sauce, roast spuds and parsnips and chestnuts! And I think it might be chicken for us too next year. Anothrr request to see your whole quilt! The little peeks are torture! Hello Lynda, thanks for popping by and leaving a comment! Well, I think you will have to be patient a little longer ..... when I've finished it I will take some full length photos, I promise! we got married in the gap between Xmas and the New year, hence it is our anniversary today. As we eloped to Gretna, we thought no-one would notice if we slipped away! so these days between the 2 holidays are special to us. Your textile is delightful, I love the colours and stitching. Happy new Year Lynne. How wonderful, Kath, and how romantic! you will be enjoying your celebration as I type - my congratulations to you both. Love the colours of your post Lynne ! I just picked some red balls and some felted little things to put in it. "see" you next year ! Lynne your house looks beautiful with the cards strung up, just right. We still have lots of leftovers to eat, although it's getting a bit monotonous now! We rather over did the food shopping! Back to work today and tomorrow for us so we need to get back to normal. I like your tree and I just love your house photos. Lots of books! 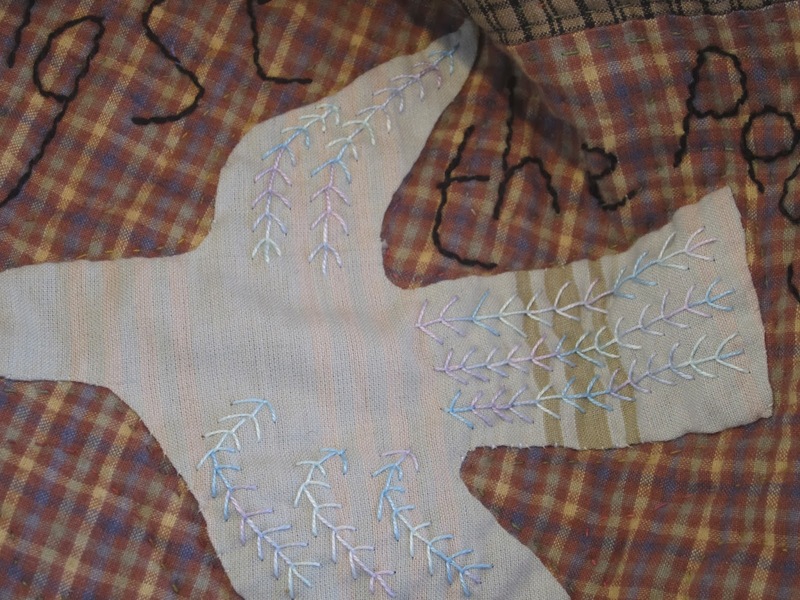 Your embroidery is gorgeous, I am looking forward to seeing your quilt finished!! I look forward to sewing next year. I have enjoyed being "inside" your cheery charming house at Christmas-time. 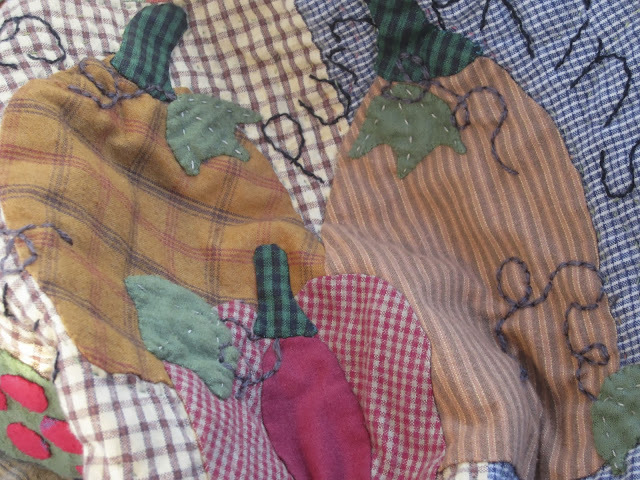 I would just love to wrap up in your gorgeous appliquéd plaid quilt. West Norfolk looks stunning, so very green. I bet it's colder here. Currently it's minus 17 C and probably dropping 4 or 5 degrees over night. We will put a fire in the fireplace and drink something bubbly tomorrow evening, staying right at home and falling asleep before 2014 comes in. Happy New Year! Hi Andrea, thank you, yes, we are a bit warmer here than you in Minnesota! Happy New Year! With a family of 6, with boyfriends, girlfriends and friends nothing much is leftover in this house! That quilts looks tantalisingly close to being finished, maybe it's one of those projects that you want to last forever and don't actually want to finish?